Ambassador Qinguo, accompanied by his wife Madam Zheng Chuncao, was on his first official visit to the island. 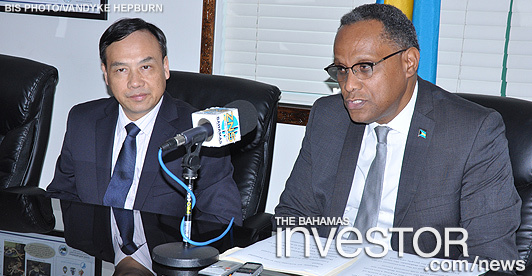 In welcoming the Chinese Ambassador during a courtesy call at the Ministry for Grand Bahama, Darville pointed out that the governments of The Bahamas and the People’s Republic of China share a longstanding mutually beneficial relationship, which has resulted in economic growth and strong bilateral ties for both countries over the past two decades. Prime Minister Perry Christie has indicated that construction has restarted at the stalled Baha Mar megaresort on Cable Beach.